“How much sorrow can one man have to bear? As much as a river of spring water flowing east” goes the poem from which The Spring River Flows East derives its name. Indeed, a whole lot of sorrow – plus some action and drama too! – is spread across the three-hour running time of Chusheng Cai and Junli Zheng’s epic, often cited as one of the masterpieces of Chinese cinema. 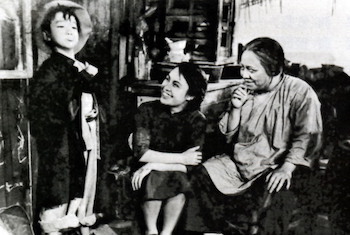 The film begins in 1931 and ends in the late 1940s, covering the lives of one family before, during and after the Second Sino-Japanese War, and is split into two parts. In part one, we meet a young couple, Zhongliang and Sufen. Zhongliang leaves his wife, mother and infant son behind to fight in the war, where he’s captured by the Japanese. By the second half, Zhongliang has escaped his captors and been taken in by a wealthy acquaintance. Finding himself in bourgeois society, he forgets about his family and his morals. Meanwhile, Sufen suffers more and more, turning to desperate measures to feed her son. It’s a Chinese equivalent of a David Lean epic – the personal struggles of a small group set against the sweeping backdrop of history. Though actual action sequences are sparse, the filmmakers cut in genuine newsreel footage, which builds up both tension and veracity. In Zhongliang, we have an excellent portrayal of a man who starts out as a revolutionary and a romantic but is changed by the situations he’s thrown into, becoming a coward and a cad. But the tears referenced in that poem surely belong to Sufen; her increasingly harrowing conditions have a real sense of desperation to them, and you’ll be rooting for the family to find some solace. Starburst 434 - Out Now!